SOUTH KOREA: Samsung Heavy Industries has denied recent reports it is to exit the offshore sector despite launching a strategy review of its activities in the European market. In a statement, a spokesperson for Samsung Heavy Industries said: "It is not true that we are pulling back from the offshore wind industry. "We will keep working to secure a high performance prototype and focus on developing new technology. We have made rapid progress so far and the immediate focus is on quality not quantity, as we remain in the early stages of the offshore wind industry. "Reviewing the business strategy is completely different to giving up the business." However the company confirmed it is currently looking at its "business strategy" in the European offshore market and its "future within the European offshore wind sector." 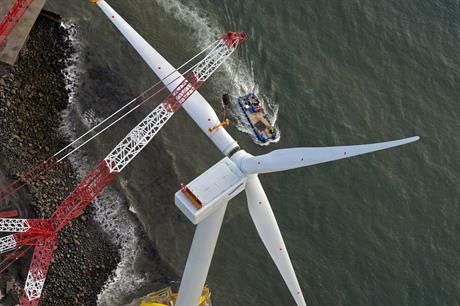 Samsung has installed a 7MW offshore turbine at the Energy Park Fife in Methil, eastern Scotland. Testing was due to begin at the end of last year but a damaged blade, manufactured by SSP, pushed the commissioning date back. Samsung has invested £70 million (EUR 82 million) in the project and were planning to have a 19-strong team to work on the testing programme over the next five years. In 2012, Samsung formed a consortium - Daejeong Offshore Wind Power - with Korea Southern Power to build 84MW deal to build an 84MW offshore project off Jeju island near the country's south coast.